Congratulations to Emilio on the selection of Crusher as the January Miata of the Month! Editor's note: As far as we know, Crusher is the only production car to ever win sprint, time trial and endurance national championships - all the same year. Read on to learn more about this remarkable Miata. The goal was to build a purpose designed enduro car - specifically to win the NASA 25 Hours of Thunderhill endurance race held every December. I had looked at the current status quo in D/E2 class and realized I could do better. The math pointed to a car that would be 1 second/lap faster than anything in the class. The car was purchased from a policeman friend of mine for $1100 in 2010. It had sat neglected for a year, beat up and truly filthy, a random .45 bullet hole in the passenger door hidden under some bondo. A future winner? Those were some high aspirations for the sad looking NB under a thick layer of grime on flat tires. Work began spring 2011. John Wing, resident engineer and car builder stripped it to the bare tub with a chemical dip then sent to TC Design in Milpitas, CA for seam welding and a cage. When the now caged tub first arrived back from the painter resplendent in shiny new Fiat “Arancio Europcar” paint, it was parked next to our recently acquired bright orange Harbor Freight 30T press. I made a joke about wanting to goof around and crush something in the new press. Pausing to stare at the tub next to the similarly garish orange press a moment, the name popped into my head. 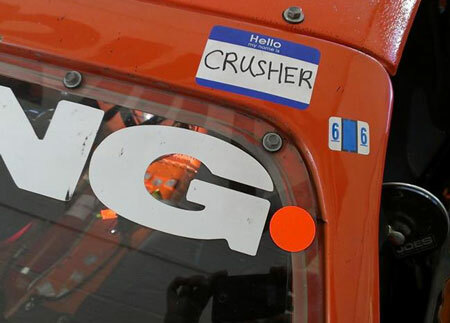 Crusher. Delayed by a combination of me constantly updating its design and various niggling problems with its proprietary components, it was early October 2011 before the car was running. Its first event was a NASA regional race at Buttonwillow on Oct 11, 2011. We worked straight through the Friday night before the race to get the car ready. Working on zero sleep we arrived at the track late and missed the first practice session. Other niggling issues with something in the engine compartment meant we missed qualifying too. Up to this point, the car had never run more than a brief 45mph burst in the street behind our shop. This meant its first ever time touching track or getting into 4th gear would be the green flag at a club race. Not so well conceived but those are the kind of decisions one makes after a serious lack of sleep and dreams of a shiny new race car! Of course we found a host of new little problems during the race, not the least of which was an ignition misfire. That ignition misfire would prove to be the bane of my existence as it took until the first week of November before the problem was solved completely. 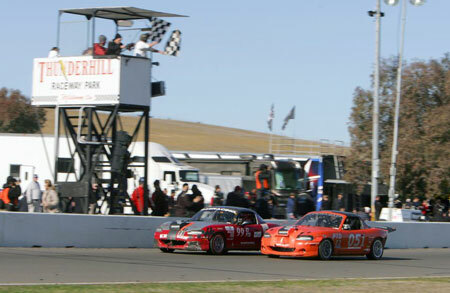 Crusher did not win the 2011 25 hours as we had hoped - but its sister car “Enzo” did. The orange car did qualify on pole and was the fastest E2 class car but suffered from an error in the pits that cost it the sure win. Right car, wrong team management decision. In 2012 we won the NASA Road Race, NASA Time Trial and the NASA Endurance National Championships with Crusher. It set lap records at all seven of the tracks it raced at in 2012. 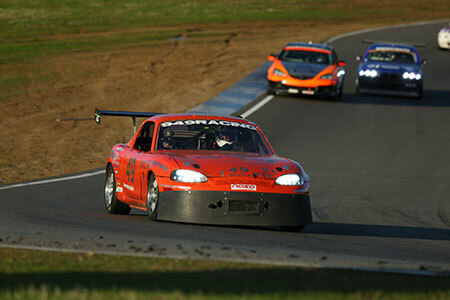 The success we had in 2012 more than made up for Crusher not winning the 2011 Thunderhill 25. But we still had one more box to tick off. A class win - the faster E1 class this year - and top ten overall finish at the longest endurance race in the world. At the start of the race all four cars on the team looked solid but one by one they would succumb to contact or, in the case of our E2 entry Nemo, every possible mechanical failure. Our shining hope for a win was Crusher, valiantly trading the lead with the pro team of CJ Wilson racing. Crusher was a touch faster, the #55 NC MX5 of CJ Wilson spending a bit less time in the pits with scheduled service (brakes, tires). We had no issue until the early morning hours when the Racepak IQ3 dash flashed a low voltage warning light. Thinking the alternator was dying, I radioed in to prepare for a swap. About two turns later the dash flashed a high coolant temp light, 264°! A wave of shock came over me then passed in instant. Clutch in and coast. Think Emilio! Alternator belt is coming apart as voltage was fluctuating. That’s it. Low revs, nurse it in, don’t blow the head gasket. At this point, we had a 2 lap lead that turned into a few lap deficit as the crew pounced on the repair. Belt tensioner rigged, locked in place, new belt and we were back on track. Now with instructions to up the pace, I head back out. With about 5 hours to go we found ourselves with a comfortable 2 lap lead and pulling away. We began backing off our pace to preserve the car, “pedaling” it as we like to say. That's when the shift turret on the 6 speed transmission came loose, puking gear oil all over the hot exhaust and filling the cabin with smoke. Argh! I quickly deduced by the smell of the smoke it was trans related and radioed it in. Again the Car Chief Keith Tanner and Head Mechanic Andrew Kidd pounced on the repair and had me out in less than ten minutes. Our 2 lap lead had again evaporated and with only a few hours left, we had but one strategy: put new brake pads and tires on the car during the turret repair and drive flatout to the finish. At this point I had already been in the car for 3+ hours straight and had already driven about 7 hours total. I was tired. Leaving the pits I radioed in for my target lap time from our race control. I believe he said something like “all of it”. I proceeded to set fast lap for Crusher on lap 584, over 2s under under our qualifying lap time. It was an electrifying experience. The car was slightly down on power but still carving the turns like an Olympic bobsled. Slicing through traffic we managed to claw our way back to the lead with less than an hour to go. On the very last turn of the last lap of the race, I squeaked by the #55 MX5 to put them another lap down. 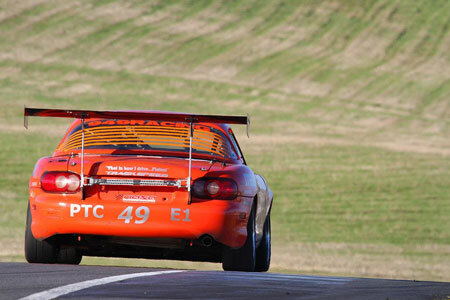 As much as the individual experience of winning such a big race means, the larger thrill was having this little orange Miata be the focus of our entire team. It felt like the will of the team behind the wall would not let it fail, such was the energy in our paddock.